Sling TV was just the first step. 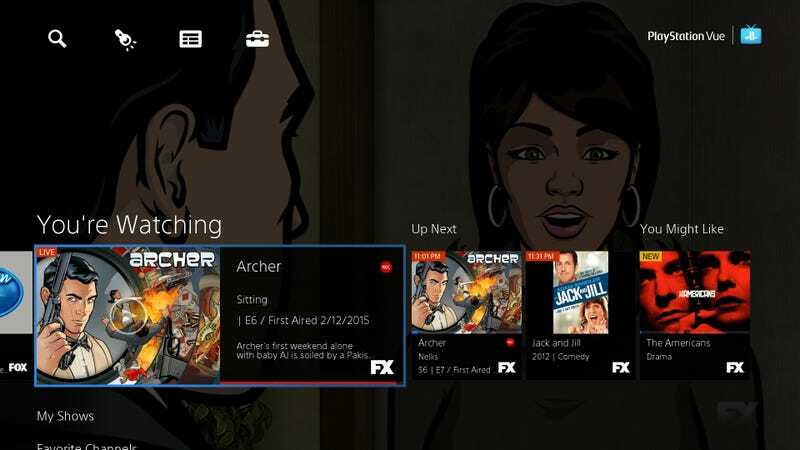 Now, Sony's PlayStation Vue is taking internet TV to the next level. Starting at $50 a month for some 50 channels, you'll still be paying cable prices for what you get, and there'll be channels you'll miss—but trust me, you've never seen TV quite like this. PlayStation Vue takes a little bit of explaining, mind you, so bear with me a sec. What we're talking about is a service, launching today in New York, Chicago, and Philadelphia, that streams both live and pre-recorded TV programming over the internet. It includes most major broadcasters—including their local affliates, so you'll get local news and weather—and a good number of the cable channels you'd want. It streams at 720p resolution, so you only need a stable 5Mbps internet connection or better. As of today, though, you need to live in one of those three cities and have a PlayStation 4 or PlayStation 3 game console. More platforms (including iPad) and markets (Sony says it's targeting large cities first) are coming later on. It's a no-contract service with no promo prices, so you can pay your $50 a month as long as you like and quit anytime you want. But that's not what makes PlayStation Vue special. It's just how freaking easy Sony makes it to watch what you want to watch. Be sure to hit that little magnifying glass icon in the upper-left corner for a larger view. If you just want to pick a channel and gorge yourself on live television, you can totally do that with PlayStation Vue. You can even see a nice big grid with helpful red progress indicators that let you know how much time is left in any given show. And if you don't know what to watch—but know you're in the mood for some particular genres, or that you only have 30 minutes to kill—PlayStation Vue has an "Explore" tool that'll find some winners for you. But the real meat and potatoes of PlayStation Vue is that once you know what you want to watch, Sony's streamlined interface will show it to you regardless of whether it's live, pre-recorded, or on-demand content. You press a single button—R1 on your PlayStation gamepad—to favorite any show, and from that point on Sony will give you access to any episode broadcast in the last 28 days just as if you were recording it yourself. If Sony has access to on-demand episodes, they'll appear right next to the live and DVR'd content: just scroll left and right to see them all. You can favorite as many shows as you want—no worrying whether you've got space on your DVR or how many you shows you can record at once. And yes, you'll be able to fast-forward right through the commercials as long as you've favorited a show. Depending on Sony's negotiations with the networks, you won't even need to favorite some shows in order to go back and watch episodes broadcast within the last three days. As you can see in the screenshot above, Entertainment Tonight and Just Go With It are greyed out, but you can "catch up" with some shows on Animal Planet and DIY without opting in first. What's the catch? First off, access to "every episode broadcast within the last 28 days" means you won't necessarily be able to binge on any given show. Take a look at The Big Bang Theory: you can watch episodes 16 and 17 in order, but then you're back to reruns of episode 11 and 12 with no guarantee you can fill in the holes. And really, that's the problem with internet TV so far. No one service will let you completely cut the cord. You'd need a combination that'll cost you as much as you're already paying for cable. Still, it's impressive how far we've come. There are also some lingering questions, like how long Sony will hold onto shows and networks before its deals expire, whether prices might rise, and how intrusive advertising might be. Sony told us that there aren't any current plans to show pre-roll ads or raise the monthly rate, but there's nothing guaranteeing they won't. We also haven't actually tried Vue ourselves yet, so we can't say if there's some hidden dealbreaker that only appears when you're surfing channels in the comfort of your own home. Sony gave us a lengthy walkthrough, but wouldn't let us pick up the controller. But for those people who'd be willing to pay for the current selection of channels, PlayStation Vue sure looks swell. We'll have a full review in the coming weeks, so keep an eye out.